GNOME Calendar 3.28.2 was released yesterday. If you were having crashes and problems, please upgrade immediately. Quite a few crashers were fixed, and a few polishes went in too. Hopefully the experience of using Calendar will be much more pleasant now. This new version was available in Flathub just half an hour after yesterday’s official announcement. Flathub is the only distribution mechanism that I officially support – if you rely on distro packages, please ask your distro maintainers to update. It’s been a long time with no news. I guess work and masters are really getting in the way… good news is that I’ll finish masters in 2 months, and will have some free time to devote to this beloved project. “Bad” news is that, after almost 6 years, I’ll finally take some time to have a real vacation. I’ll stay 3 weeks out of the loop in February, a time where I’ll be traveling to the other side of the world, watching the sunset at the beach with my wife. Without a computer. While it’s unfortunate to the community, I think this time is necessary for my mental health – I’ve gone way too many times through the almost-burned-out state recently. But even with all of these thing in our way, thanks to the help of awsome old and new contributors, Calendar and To Do received a lot of new features! The day numbers are at the top of each cell now. This is thanks to the hard design work of Allan Day, Jean-François and Lapo. Each cell now only shows the overflow button when absolutely necessary. When implementing this new behavior, a few longstanding issues were fixed. The Month view now finally has a fully working, sane code to deal with RTL languages. When clicking the +N button, the cell “zooms in” and display the list of events. This is a big design improvement over the popovers that we were using. Code-wise, the Month view code that position the events is an order of magnitude simpler and easier to read. It may sound like a purely technical matter, but it has user-visible effects too: easier, cleaner code means more features and less issues in the future. The animations were implemented usuing the animation framework in libdazzle, all thanks to Christian Hergert’s work on GNOME Builder. Kudos! We’re on track to land the features that were proposed for this cycle. You can check out the plans at the Roadmap page of Calendar. You can also get help us with these tasks with design, code and testing! GNOME To Do also received a lot of attention already. We’re going through a big redesign, thanks to the leading design work of Tobias Bernard, and the results are already gratifying. The rows are entirely draggable now. I’ll continue working on these features, but more importantly, I want people to take some of this work over and contribute to the project! A designer moves the task to “Design” column and works on it. Once design is settled, a developer moves the task to the “Development” column and fixes/implements the task. When the task if implemented, the developer moves the task to “Code Review” column, and a maintainer will review the code. Once the code is reviewed and the code landed, the task is moved to the “QA” column, where a tester will pick up and test it. While many of these changes are super exciting, this is just the first part of the cycle. There are much more to work on, and the more people get involved, the more we will accomplish. Things are moving in a fast pace, and I’m incredibly happy with the direction of these projects. To help pushing community involvement, I went ahead and wrote a page describing how can you help testing. With Flatpak, this is ridiculously easy – and yet, absolutely necessary! So, don’t hesitate to get in touch and help us shaping the next GNOME version. This year’s GUADEC was amazing. I’m really happy I could attent it this year (even though my tasks are accumulating and I’m really afraid to look at my emails again…). I’m still in Manchester so, if anyone wants to meet me and buy me a tea, do get in touch! I had a special interest in Richard’s talk. He raised many relevant questions and exposed how complicated it can potentially be the problem of donations and payments. More about that in the future. I had the chance to sit down and see a power user interacting with GNOME Calendar. It was an unique and enlightening experience. I was able to see a few areas where Calendar can do better in terms of UI/UX. Unfortunately, GNOME To Do didn’t have the same luck. I’m still somewhat unhappy with the current UI of To Do, but I’m running out of ideas on how to improve it without a complete rewrite (which I simply don’t have time to do now). If you’re a GNOME user with any kind of background on design, ~please~ get in touch: I’d love to gather some feedback on To Do! I had the chance (and honor) to be present at the discussions for GTK4. In these discussions, we did a big list of topics and discussed each one of them in details. I admit that, during these discussions, I felt like a kid at times – the GTK hackers are incredibly smart and skilled people. The other side of the coin is that, while I was feeling like lagging behind them, I also felt honored and happy to be surrounded by such amazing people. The biggest problem to solve now is the accessibility stack. After digging into the topic and clarifying how it works, we concluded that this topic was too big and complex for that moment, and deserved a hackfest of its own. We’ll organize one during the next months. Wrapping up, I can’t state how productive these discussions were. Thanks to Matthias Clasen, Benjamin Otte, Christian Hergert, Cosimo Cecchi and everyone else that drove the discussions. We now have a solid GTK4 roadmap that I’ll move to the GNOME Wiki in no time. An unexpected thing happen during the Unconference days. When talking to my good friend Mario we asked ourselves: how can we improve our own Endless tasks by upstreaming our features? Endless OS shell has many features that GNOME Shell doesn’t, and maintaining downstream patches is expensive and simply not cool. One of these features was specially important, as it is difficult to maintain and lots of GNOME users frequently ask for. This specific feature was considered in the past, but had many design constraints and we end up never solving it design-wise, nor implementing it. After a rather spontaneous group discussion, we found solid solutions for all the relevant edge cases of this feature 🙂 I’m sure Mario will write about it in the future, and probably will implement it as well, so stay tuned! After a long explanation and discussion with Florian Müllner (and of course, getting him a well deserved beer for being the GNOME Shell and Mutter maintainer!) the path for quarter-tiling is much clearer now. The original idea is to implement tiling support using constrained edges, rather than tiling states. But this is hard, and now I believe it’s effectively impossible to do that. Olivier Fourdan tried to propose a Wayland protocol for that, but discussion ended up freezing and no progress was made for a long time. I admit I’m kinda scared to try to send these changes upstream… see the bug’s feedback (sometimes I forget that the GNOME community is much more welcoming than many other FOSS communities). I now have a real problem to solve, and the time is not enough. Perhaps it’s time to declare bankruptcy? I’d like to thank the GNOME Foundation for sponsoring me. I sincerely hope that my engagement and contributions pay off this investment! I also thank my employer Endless to let me join. The upstream contributions we’re doing are valuable for the community, and in turn it helps us lowering the number of downstream changes to maintain. This morning, I had some free hours to spend on my baby Calendar, and of course I’d spend on what matters the most: the Week view. And, as always, the traditional sequence of pictures with an awsome rock-ish soundtrack! Today, the Calendar Team had the first meeting in history. Isaque, Lapo, Renata, Vamsi and I attended it, and the meeting was extremely productive! In fact, we were able to sketch out the general direction that GNOME Calendar will head towards. Lets start talking about the additions that Calendar will have. The search would behave just like the redesigned GNOME Control Center, and in fact, using a sidebar fixes many issues we currently have with GNOME Calendar, like the search popover and random glitches all around. The sidebar will be able to be hidden, just like Nautius’ sidebar, so people can have their old Calendar again, behaving just like it used to behave. Stay tuned. This is something I myself use frequently, but cannot do with Calendar. Obviously, this will be integrated with GNOME Contacts and will support mailing the attendees. There are some pain points that we want to change in GNOME Calendar. Thanks to Renata, we have a much clearer picture about the big bottlenecks of Calendar now: adding new calendars and promoting Online Accounts. We’ll also turn the calendar management dialog into a wizard-like dialog, and make it more pleasant to work with. Fortunately, Isaque has a deep understanding of the Year view, and we’ll turn Year view into a GtkFlowBox-based widget, and share the same month widget (and behavior) all around. Exciting times ahead! Of course, I didn’t cover every single thing discussed in the meeting. Obvious things like recurrences, more reminders, natural language support, jump to date and many other things are not worth the time – they’ll be added. Period. In general, I’m very happy that this meeting happened. There is a team of contributors growing around Calendar, and this is awsome! Remember that the very first post in this blog was about the Calendar revival? It was a long way from a dead app to a serious core project. A big thanks for this awsome team that is putting time and efforts to make Calendar a better application – without you guys, there wouldn’t be a Calendar! The best GNOME release is the next GNOME release. is still true! Between backend reworks, Summer of Code projects and spontaneous contributions from awsome random contributors, here are the things that I’m looking forward with GNOME 3.22 release. Let’s face it: Nautilus is heading towards a bright future and it’s getting in a very good shape – and the community that is growing around it is absolutely gorgeous. Obviously, this is not random; Carlos Soriano is working very hard to make it happen. This leads not only to fun IRC chats, but tons of contributions. Nautilus’ codebase had its style unified, making it very nice for newcomers to send their patches. After a huge work on Nautilus’ internals, things are in a better shape now and new features are popping up. If you want a more complete list of Nautilus improvements, check Carlos’ blog post about it. Below, the ones that caught my attention. Another detail that required lots of improvements on how Nautilus works is the integration of compressed files. This is the kind of thing that gives Nautilus a kudo for the attention to details. Having progress report in the Nautilus progress popover and a built-in way to create compressed files makes me feel like Nautilus cares about me 🙂 Thanks Razvan! Lots of annoying bugs were smashed! In one phrase: I can use Music now. My music collection is considerable (over 9000 individual songs) and GNOME Music simply couldn’t handle it. Let me be crystal clear: Tracker is fast as hell. GNOME Music was slow to death. Retrieving the list of songs from Tracker takes about 0.25 second, putting the songs into a window and presenting it used to take ~85 seconds. Yes, that’s right, 340x slower. This new app is surprising me. A lot. I was trying to play Spyro 3 – Year of the dragon for months, without success. Then I tried GNOME Games – without success too. But at least, I could report my issues to Adrien, and what a supportive guy he is! With his help, we were able to debug my failures and, surprise!, he fixed it right after. And now, after a journey through different PS1 emulators, I can play Spyro again. I could only get it working using Games from Flatpak’s nightly builds – but hey, it works, that’s what matters. Thanks to the amazing team that leads the development of Gtk+, it keeps receiving a flow of new features, improvements and fixes so fast that it’s hard to track. This round, I was able to add a small feature, the CSS background-blend-mode property support. It definitely isn’t a big thing, but I learned a lot throughout the whole process and I plan to work on more CSS3 features like filters, blend groups and others (and finally give Lapo all the tools he wants to create his crazy themes). But wait! The greatest thing that Gtk+ will receive in 3.24 (or rather, 4.0 if I understood the new release scheme correctly) is the Gtk+ Scene Graph (aka GSK), thanks to Emmanuele. I’m looking forward using it in a future release! Some things didn’t make for this release. I’m particularly sad about GNOME Control Center, which received a new UI but won’t switch to it because not all panels got ready in time. Also, Nautilus’ actionbar wasn’t good enough too – we weren’t satisfied with the end result, and decided it needs more research and love. Basically, everything I touched outside GNOME Calendar. Sorry, folks! … but we’ll get there! So now it’s time to start planning the next cycle – this time, I want to try something new and decide some features based only on community input. I’ll run pools and decide the priorities with that, ask around and really try to get the community involved in the whole process. Stay tuned! I’d like to thank my employer Endless for allowing me to work on GNOME – it’s awsome that I can do what I love to do as part of my job. Thanks, Endless! In another of my (appearently common) insomnia nights, I decided to add a cool new to my pet application – Calendar. Something fast enough to be done in one night, but still useful. One of the most intuitive ways to interact with an application is reproducing what we do in real life. Applications try to shorten the learning curve by using metaphores of real world objects. We all know what GNOME Calendar is: a virtual calendar application. As such, using real-life calendars as a reference for it’s UI is mostly a good thing, except that we’d probably have an annoying time moving events around. In this regard, technology can improve what we do. And that’s why GNOME Calendar now supports dragging and dropping events around. Oh, did you noticed? Year view is much improved thanks to the awsome work of Isaque, who proved himself an amazing contributor and a good friend. And don’t forget, this summer we have an intern, Vamsi, working on the long wanted Week View.Calendar, just like Nautilus, is in it’s best moment. Time has passed and we finally made it: GNOME 3.20 just got released. I’m writing this post in a full GNOME 3.20 + Wayland session (thanks Arch folks, [gnome-unstable] is amazing). I’d like to take some time to reflect about this release, what happened and what didn’t happen. While this certainly wasn’t the biggest feature release of GNOME Calendar, I’m very satisfied with it. Not only it went through a major rework that will make future development much easier, but also 4 new contributors had their patches in. 4 new contributors. They polished lots of rough edges. Thanks to these contributions, past event are now less proeminent, year view is much more visually appealing and respects GNOME Shell’s setting to show week dates. Year view improvements and faded past events. Not only that, but Month view also received subtle improvements. The rendering code now ensures a pixel-perfect selection, more proeminent background for selected days and navigating to beyond the last days switch the month. Good news? I didn’t do any of these features! They were all contributions from independent, warmhearted people spread all around the world. This release made GNOME To Do shine. I spent most of my time working on the new plugin support, and learned a lot to make it work correctly. Thanks to Garret Gregier, Patrick Griffis, Christian Hergert and many other supportive and warm people, the engine works good and soon I’ll write a small series to demonstrate plugin development. Plugin support for GNOME To Do. Oh, dear Nautilus. I’ve worked on you as a Summer of Code project, then as a free-time project, now it’s a paid-time project. I love you, but I disdain you. Your old codebase with loads of obsolete code makes my spine chill, and yet I can’t leave you crying in the rain. This cycle, I worked on the new Search feature. Then Carlos finished what I’ve started, so he deserves all the credits. Check his post about it. This is coming next: action bars. Poor GNOME News, almost dying. I managed to push some changes on it, but it’s far from perfect. Maybe I’ll manage to sneak more improvements during 3.21 cycle? This was a good cycle. I’m very proud of how much better GNOME got during the last releases. It’s definitely getting to a stability and usability points that we saught since the first 3.0 release. The apps are slowly (no so slowly anymore) getting mature and useful. Aye folks! This was a very productive cycle for GNOME Calendar, and this release is the result of a hardworked cycle. First of all, the bad news: no DnD support, no Week View, no, no, no! The reason is simple. Sanity. GNOME Calendar is build on top of Evolution-Data-Server, so we don’t need to write an entirely new backend and to guarantee system integration (GNOME Shell uses it to fetch events, for example). The problem is that EDS is an “[…] unholy mess“, and it reflects on Calendar. 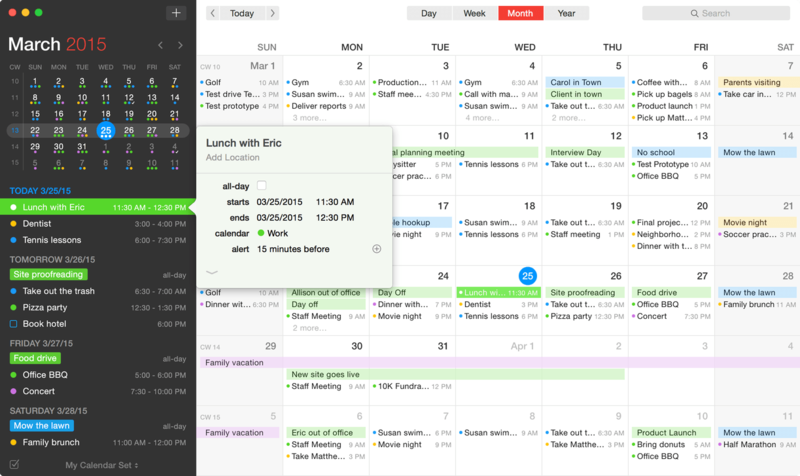 No matter how skilled are the engineers behind it, Calendar was reaching a point of messy code. No one likes messy code – it makes newcomers run away, maintainers avoid improvements out of fear of breaking the app, the app dies, no one’s happy. So I decided to not let it reach this point, and did a major rework and cleanup of Calendar internals. Believe me, it wasn’t easy. The good thing is that we’ll be able to avoid commits like this and this, and after reworking the internals, fixing long-term, hard bugs was a piece of cake. From now on, Calendar is going the right way (IMHO) and we’ll avoid messy code and obscure paths. Now, let’s go to the cool things. Following the recent trend of “Popovers Everywhere! TM”, the quick add popover just got better. Now, the user can select in which calendar the event will be added without having exit the popover. Long-term plans include adding natural language support, so we’ll be able to extract the location, start & end dates from the event summary. Implementing this popover was a delight after the new rework. Thanks, Isaque! I hope you keep up with your really good work. Most people didn’t know Calendar had so many shortcuts! Since Calendar received such a major overhaul in it’s gears, I need to make sure it is stable and good enought. So I hereby request that, whoever has the chance, please test Calendar. Thanks! Any ideas, comments or suggestions? Leave a comment below!